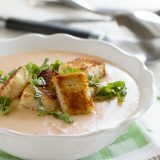 A great way to use up fresh tomatoes, this Cream of Tomato Soup is creamy and has a delicious, mild tomato flavor. Don’t skip the homemade croutons – they taste like buttered toast in your soup! Make the white sauce: Preheat the oven to 350ºF. Melt the butter in a large ovenproof saucepan. Whisk in the flour and cook for 1-2 minutes. Slowly whisk in the milk. Add the onion and the bay leaves. Frequently stir the mixture until it is slightly thickened, 10-15 minutes. Transfer the pan to the oven. Cook for 20-30 minutes, until the sauce has completely thickened. Remove the bay leaves and the onion, and add a dash of fresh nutmeg. Make the soup: In a soup pot, combine the tomatoes, celery, onion and sugar. Simmer together, covered, for about 15 minutes. Transfer the mixture to a blender or food processor and pulse until smooth. Return the tomato mixture back to the pot. Add the white sauce to the tomato mixture. Season to taste with salt and pepper. Heat for a few minutes, until completely heated through. Make the croutons: Cut the bread into squares. In a skillet over medium heat, melt the butter. Add the olive oil. Add the bread cubes and stir to coat. Saute the bread cubes until they are toasted on all sides. Top each serving of soup with some of the croutons and a bit of fresh basil.